A few weeks ago I went to Austin for a wedding and decided to check out a place called the Alamo Drafthouse while I was in town. It was definitely a unique experience as I happened to visit on a day that they were showing Alfred Hitchcock’s The Birds, which I never thought I would see on the big screen. However, the film is not what stands out most when I think about my trip to this theater; instead, it was what I saw in the hallway on my way out of the building. Upon exiting my movie, I was greeted with a floor to ceiling mural of the poster for Hammer Studios’ Taste the Blood of Dracula. Being a long time horror fan I was instantly impressed that somebody picked this movie, of all movies, to decorate the hall with; especially since it had such a limited release in the United States. Moving on down the hallway towards the exit, I stopped short when I noticed that the next mural is a poster for the same studio’s film Night Creatures. 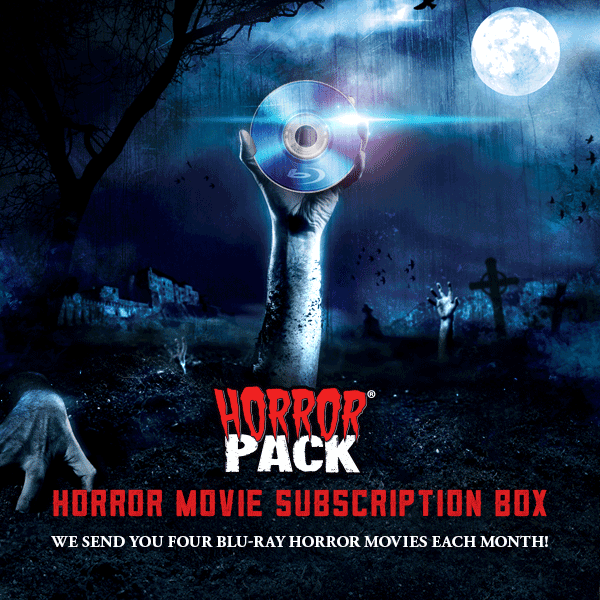 Some people may be familiar with Hammer; a British film studio well known for their horror films, particularly their remakes of classic Universal Studios monster movies. Less people are probably familiar with their Dracula films which include the aforementioned Taste the Blood of Dracula (starring the late Christopher Lee), but I can guarantee that hardly anyone has seen or heard of Hammer’s Night Creatures. I first saw this film as a kid when it came on either TNT’s MonsterVision, AMC’s MonsterFest or something like that. Regardless, seeing a poster for the movie some 20 years later instantly brought back memories of the film, so I decided to give it a re-watch as an adult to see if it has held up over the years. The film opens, as most classic horror movies do, with an unnamed pirate being marooned on an island for killing the wife of his equally unnamed captain. There is no explanation for this scene and it basically leaves the viewer scratching their head and wondering if they’re even watching the correct movie. Then we see the title screen which is a complete tonal shift from the Pirates of the English Channel intro which we were just given. A scarecrow looks out over a misty landscape of marsh and moor as we are told in jagged yellow font that the movie which we are about to enjoy is going to be starring Peter Cushing. 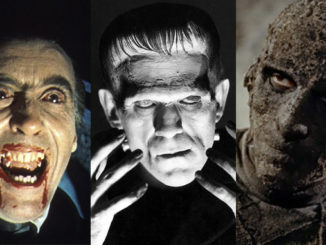 For those of you unfamiliar with Hammer Horror, Peter Cushing is a favorite actor of the studio who has cast him as Van Helsing, Dr. Frankenstein and an archaeologist in their Mummy remake. On a related note, Cushing also starred as Grand Moff Tarkin in a lesser known film from the seventies called Star Wars. Back to Night Creatures; by means of an opening crawl, we are introduced to a marsh-side community where a local legend involves a group of Marsh Phantoms who terrorize anyone foolish enough to wander into the marsh at night. Enter said fool, a local who is stumbling home through the marsh just as the sun is beginning to set. No sooner have the last rays of light left the sky than he is assaulted by a group of skeletons on horseback who promptly knock the poor man into the water thus drowning him. Let me say, these “phantoms” are practical effects at their worst; the viewer can immediately tell that they are extras in costume and seem to be very solid for phantoms. 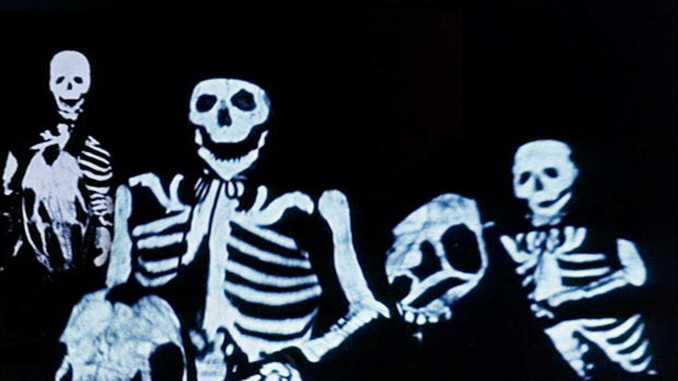 For the rest of the film these physical aspects (pun intended) are painfully obvious anytime the phantoms are onscreen. It almost takes the viewer out of the film that the wardrobe department did such a terrible job; or did they? Following the ghostly nighttime attack, we are introduced to the two lead characters: Reverend Blyss, a priest who is running a smuggling operation out of the village and Captain Collier, an English officer who is investigating said operation. Herein lies the majority of the plot: Collier investigates and Blyss continuously outwits him. While all this is going on, the Marsh Phantoms are the ever present thorn in the side of anybody who gets to close to discovering the truth behind the smuggling operation. There is also a romance subplot that is shoehorned in there involving the mayor’s son and the adopted daughter of Blyss. With all this going on with Phantoms, Smugglers and Englishmen, one may wonder as to why we had an introduction with pirates. 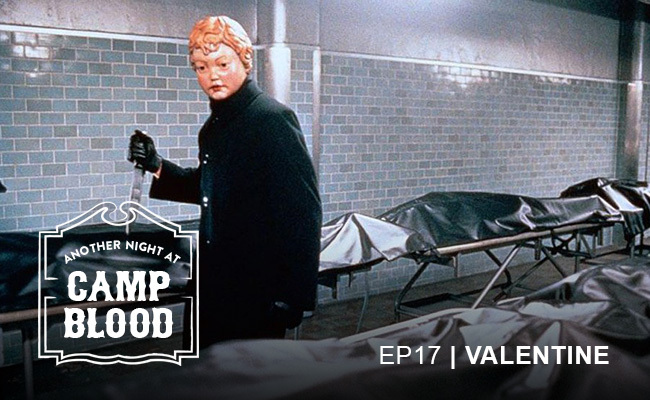 This lays the groundwork for one of the most legendary series of twists in cinematic history. Needless to say, spoilers ahead. It turns out that Blyss is none other than the deceased Captain Clegg. Who? Captain Clegg is the unnamed pirate captain from the beginning of the movie who marooned one of his crew for killing his wife. This marooned pirate has since been picked up by the English authorities and serves as the plot device which reveals Blyss’ secret identity. To add even more shock value to this revelation, we are told that Blyss’ adoptive daughter is actually Captain Clegg’s/Blyss’ flesh and blood daughter. These revelations would have been much more meaningful to the viewer if they actually knew or cared who these people were, but some of the shock value is lost when the character development is so poorly done that we have no idea who these people even are. That’s it for twist number one; if you are lost don’t worry, any viewer would be as well. Shortly after the big Captain Clegg reveal, the audience is treated to a rare double twist: the phantoms are really the men behind the smuggling operation! In the tradition of an episode of Scooby Doo, the townsfolk have been dressing up as the Marsh Phantoms in order to scare away or kill anybody who gets too close to uncovering and ending the smuggling operation. At least that explains why the phantom costumes look the way they did; a small-time smuggling operation in the English moors would never have the time, funds or energy to invest too much into their ghost costumes. Hold on, Scooby Doo didn’t come out until 1969 and Night Creatures was released in 1962. Do we have Night Creatures to thank for a lovable cartoon series that continues to this very day? The film culminates with the townsfolk coming to Captain Clegg’s defense since the money earned from the smuggling operation fuels the town’s livelihood. Just as Collier is faced with a moral decision of ending the operation thus endangering the town’s existence or allowing Blyss/Clegg to retire to the life of a father, the marooned pirate from the beginning kills Blyss/Clegg thus getting his revenge and bringing the film around full circle. 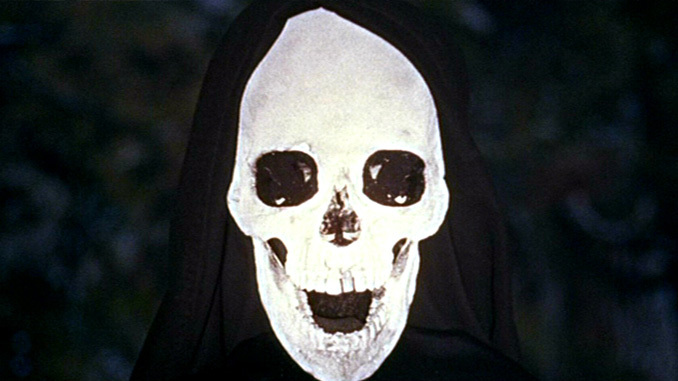 In the tradition of most Hammer films, the credits begin to roll almost immediately and the viewer is left in a daze wondering what just happened. 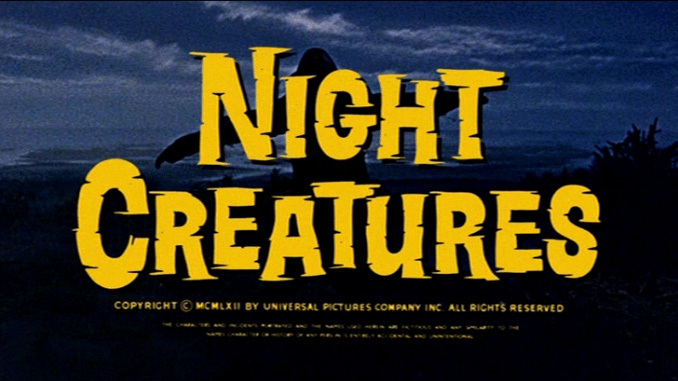 Overall, Night Creatures has earned it’s place as one of the great and forgotten Hammer Films. It is a very forgettable film for numerous reasons, mainly the derivative plot line regarding Blyss secretly being a pirate captain who is supposed to be dead. Secondly, the romantic sub plot involving Blyss’ adopted/biological daughter didn’t need to be there as the female lead exists for no other reason than to be eye candy and drive the romance plot. The film would have been just fine if they hadn’t tried to rely so much on twists and surprising the audience with reveals that no viewer would expect or even care to see. 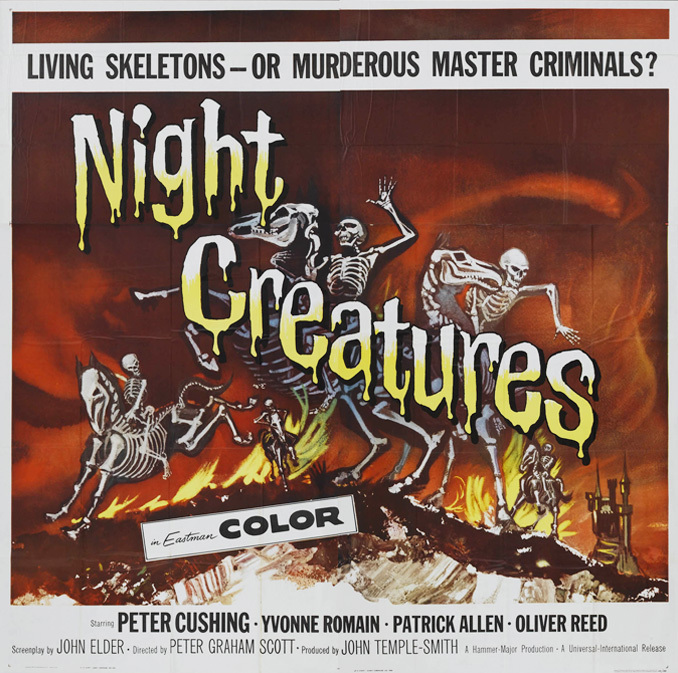 In a film called Night Creatures, with promotional posters showing human skeletons riding equally skeletal horses, one would expect the titular phantoms to play a larger part in the film. Instead, the supernatural element meant to draw viewers into the theater turns out to just be a plot device used for a twist. In this sense, the film stops being a horror film and becomes a crime thriller. The good things about the film, unfortunately, have nothing to do with the story or characters. The atmosphere is everything that one would expect from a Hammer Horror movie. Misty marshes and foggy moors abound in this movie and create a truly creepy environment. The images of skeletal horsemen riding through the mists are the memories that instantly popped into my head upon seeing the poster at the theater. The visuals are truly spectacular and almost make up for the chaos that is the plot. The effects are practical and very Hammer-esque. The early stage green screen used for some of the phantom shots are charming in their simplicity and stand out as memorable for good reasons. The fight scenes follow in the Hammer tradition of using the actual actors instead of stunt doubles and include lots of throwing each other around and destroying the set; they are awesome. The dialogue and some of the ploys that Blyss uses to outsmart Collier are enjoyable for an adult viewer. Basically if the movie were to do away with the whole pirate captain subplot and focus more on Blyss versus Collier, Hammer might have had a much more memorable film. Instead we are treated to a confusing mess where, instead of being entertained by the twists, the viewer is suspicious the whole time as to what the next big reveal is going to be. Night Creatures is not a typical Hammer Horror film as far as story is concerned; they are usually easier to follow and not nearly so reliant on twists and surprises. Everything else about the movie such as set design, dialogue, effects are classic Hammer. Definitely give it a watch if you are a fan of Hammer Horror, but don’t start with it if you haven’t been exposed to the studio before.